Posted by Wendy in Interview. Imagine skiing the height of Mount Everest 143 times. But that’s what Stephanie Jagger, a 30-year old skier from British Columbia, did. Stephanie recently broke the record for the most vertical feet skied in a single year, skiing 4,161,823 vf, besting the previous record of 4,146,890. Crazy. As in crazy amazing. I’ve never kept track of my vertical feet, but I know some people who do. A friend of mine spent all winter working to reach one million. He did it, but it took a lot of dedication. So trust me when I tell you: more than four mil is pretty incredible. Stephanie maintains that before this, she was pretty much a weekend warrior, skiing maybe 30-some days a year. To reach the record, she quit her job, traveled to nine countries and five continents, and clocked 161 ski days. I recently spoke to Stephanie to find out more about her epic year and what it took to reach this amazing milestone. Q: How’d you decide to do this? A: I’d been in marketing for a number of years and wasn’t really enjoying it, so I quit and went traveling for a month. I was up at Whistler skiing; it was one of those days that was absolutely perfect. We were sitting on the lift and my friends asked me, “What are you going to do? You don’t have a job.” I said, “I think I’d just like to ski around the year for a year and write about it.” They had a good laugh. “You don’t have the skill for this. You don’t the money.” We got to the top, and on most chairs, there’s a sign that says “Raise Your Restraining Device” or “Raise The Bar.” That was my “Aha” moment: What is my restraining device? What’s holding me back? From then that point to the time I left was a year and a half. I took a job and saved as much money as I could, even rented my place during the Olympics. Q: So you weren’t initially looking to break the vertical feet record. When did it occur to you to do that? A; My original goal was to communicate the message of Raise Your Restraining Device. But I added on to that based on what I’d skied on an average weekend and multiplied that out, then added in some travel and rest days. When I was telling people what I was doing, they’d ask if that was some kind of record until finally — I guess it was about in February — I looked it up and there was a record from a British guy. I figured that was just an extra four or five days of skiing, so why not go for it? I’m still in the process of working with Guiness. I’m not the official record holder at this point, so we’ll see what happens. If I don’t have my picture in the book next to the person with the world’s longest fingernails, I’m okay with that. Q: How would they verify that? A: I have my altimeter and a log and receipts and references. The only thing that might trip it up is if they decide they need a witness for every day I skied. But I wasn’t doing it for the record, anyway. The experience I went through meant more than hitting a certain number. Q: How did you decide where to go and how’d you plan your trip? A: I wanted to book a ‘round the world ticket because it was cheaper. So I had to plan which direction to go, since they only allow you to circumnavigate in one direction. I picked places that would allow me to ski the vast majority of the year – South America, New Zealand, that type of thing. And then from there I picked “must stops.” I really hadn’t skied outside of Whistler-Blackcomb, so the “musts” for me were places like Jackson Hole, Chamonix in France, and a few in Japan. Then I filled in the rest. I think that if I did it over again, I’d buy individual tickets as I went along, so I could have a little more flexibility depending on snow conditions. Q: Did you have a place you liked better than any of the others? A: I get asked this a lot. I think that mountains are like people and if you spend enough time with each of them, you’re going to find redeeming qualities. That said, we do have our favorite people, and we do have our favorite mountains. Some of my favorites are there for different reasons. I loved the skiing and experience in Patagonia, and for the best bang for your buck, I’d have to choose Argentina. The terrain, the people – everything was great. If you’re a powder hound, then Japan has hands down the best snow I’ve ever skied. And Jackson Hole and Kicking Horse stand out, too. I was astounded by the steeps in Kicking Horse, and it’s absolutely beautiful. Q: Was there anyplace that you wished you weren’t there and wouldn’t have minded being someplace else? A: I’d have to say the resort skiing in New Zealand is not comparable to the resort skiing in North American or Europe. There are some smaller resorts and club fields [ed note: small ski resorts owned by ski clubs] that are fantastic and are exceptions to that rule. New Zealand is a beautiful place and I would recommend people going there, but I would recommend the club skiing. Q: Were you injured at all? A: I was major injury free, I was minor injury semi-plagued. You have to take the long term view, so the minute I felt like there was something going on, I got myself to a physio or massage. I hurt my neck a little bit in Japan drying my hair, and that plagued me for the remainder of the trip. Q: What skis did you use? A: I skied on a pair of Head John 94’s, and those were the one pair I took with me. They’re a fantastic all mountain ski, and they lasted a long time. I rented a pair of touring skis for a few days, touring in South America, and I bought a pair of touring skis in New Zealand. I lost one of those skis in the back country – not a good day. When I got back, I replaced my skis with a pair of Head Motorhead Infernos, which is next year’s ski. It’s kind of like the big brother to what I have. I’ve been skiing on Head for years, and I love them. Q: Did the airlines ever lose your luggage or your skis? A: No! The only time I had to pay extra for baggage was when I took a month off and went to Indonesia to learn how to surf. They charged me on the way out of there. They wouldn’t have if it had been scuba or golfing gear, but they weren’t familiar with skis. Q: Aside from skiing a heck of a lot of vertical feet, what did you take away from this experience? A: I’m really excited that your website [TheSkiDiva.com] is specifically for women. I think one of the biggest things I learned has to do with the dialogue surrounding womanhood. There are all these milestones in our culture that mean all of a sudden, you’re a woman. It could be a certain age, or it could be getting married or having a baby. But I’m not sure womanhood can be defined this way. I think there’s much more of a journey involved. What makes it tough is that in our society, you can go through life and still be an adolescent in your mind and in the way you live. I think that the dialogue around this journey is missing and that’s something that I personally went through. I’m not sure I’m on the other end of it yet. There’s a side of me I call the “petulant child” – if I white knuckle it, I can get through anything. This is a very masculine traits. But when I get tired enough, I become emotional and different sides of a woman come out. One of the challenges I faced was how to complete a trip that was actually quite masculine in its activity, in its aggressiveness, while still handling it as a woman. A lot of the things I was doing were quite masculine, so I was trying to reconcile these two things. I feel I learned more about myself as a woman than ever before. Q: So are you burned out now? A: At the end, I could barely move. I’m not a professional athlete, so I didn’t have a network of health professionals or trainers. I found as I went along I had to pay attention to what I was eating and my energy levels. I’ve subsequently been to a number of physios and nutritionists and so on. It’s been an interesting experiment. In the last two weeks I’ve done absolutely nothing. Q: Okay, now this is important: Who has the best on mountain food and who ahs the worst? A: I think Whistler-Blackcomb and Deer Valley probably have the best on mountain food in North America. But in Argentina, there are lots of huts on the mountain that I really enjoyed. And when you go to Europe, a number of resorts have independent restaurants that are fantastic. A: I don’t think this journey for me is quite finished. I’ve been going through a whole transformation and an exploration of womanhood. I have no idea what the process is but I might put together a book. I think this whole trip taught me that if you walk into the room of life with excitement and being truthful to yourself, the doors will open. Something will come up, and I’ll know that’s what I’m supposed to be doing. Favorite phrase learned: Yuki ga futte iru…or “It’s snowing” in Japanese. 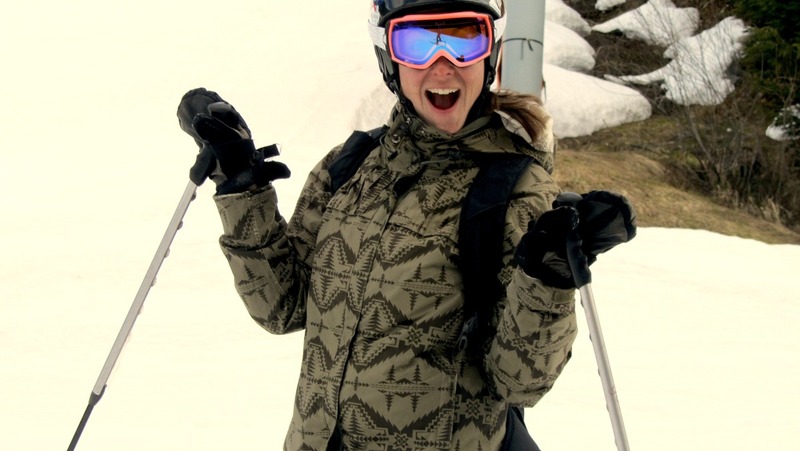 Be sure to visit TheSkiDiva.com, an internet forum especially for women skiers, where women skiers can connect with one another to talk about everything and anything ski-related.